← 251 "Insane Clown Poppy"
For The Simpsons Game level, see Lisa the Tree Hugger (The Simpsons Game). Maggie is on the couch. 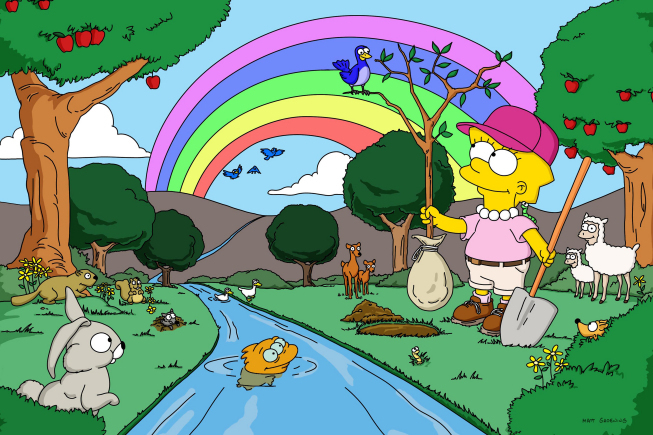 The rest of the Simpsons waddle in dressed as Teletubbies and Maggie applauds with delight. "I am not the acting President"
"Lisa the Tree Hugger" is the fourth episode of the season 12. It originally aired on November 19, 2000. It guest stars Joshua Jackson. "Eager to join "Dirt First" after witnessing their pro-vegetarianism demonstration atop the local Krusty Burger franchise, Lisa attempts to prove her worth by camping out in a giant redwood destined for logging. Meanwhile, Bart joins the workforce in order to buy a new game console advertised on television." Needing money after seeing a commercial for a new video game console, Bart is forced to get a job as a menu boy for a Thai restaurant named You Thai Now. Its owner teaches him how to deliver menus so fast nobody can see him. However, the menus he delivers soon litter Springfield, upsetting Lisa over the number of trees cut down to make them. Later the family go to Krusty Burger, only to find a group of people dressed in cow suits protesting on the roof. She meets Jesse Grass, the hunky and non-violent leader of a radical environmentalist protest group named Dirt First, who claims to be a level five vegan (he refuses to eat anything that casts a shadow). She later joins Dirt First, and after learning that Springfield's oldest redwood tree is about to be cut down by the Rich Texan, volunteers to camp in the tree to keep the loggers at bay. However, missing her family, she leaves the tree for a night, and returns in the morning to find the tree was struck by lightning. Not knowing her fate, everyone in Springfield thinks Lisa died in the storm and offers condolences to the family, which Homer and Bart briefly take advantage of. The Rich Texan also decides to turn the forest into a sanctuary in memory of Lisa, but later he changes his mind and offers to build an amusement park, "Lisa Land". Fortunately, Lisa comes to the site, and protests the park. The log being used as the sign for Lisa Land is cut loose by Jesse and heads for Springfield's business district, destroying the Rich Texan's company and eventually heads out on a cross-country journey out to the sea. Although Jesse lands himself in jail again, he has apparently not stopped his crusade for the environment. Modified on July 9, 2017, at 08:44.